Tragedy as yet another child’s lifeless body is pulled from the sea. Warning: distressing. The lifeless body of a young child was carried out of the water after a migrant boat sank after colliding with a Greek coastguard vessel. This the tragic moment a young child’s dead body was pulled from the sea after a Greek coastguard ship collided with a migrant vessel near the island of Lesbos. At least seven people, including four children, died when the wooden boat travelling from Turkey to Europe sank on Thursday. The boat sank within minutes of the crash with a 30-metre patrol vessel on Thursday morning, in circumstances that were being investigated. Sources said the boat was seeking to evade the patrol vessel. 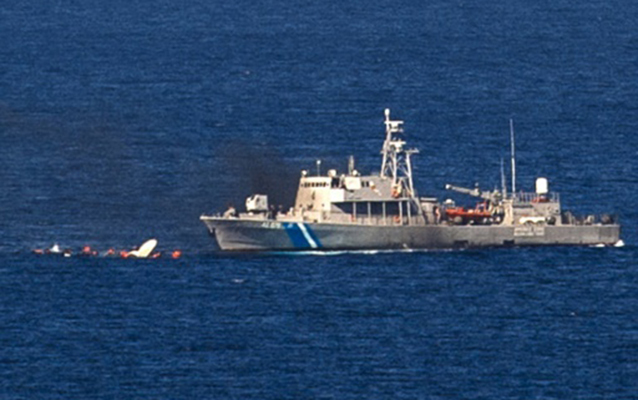 Three other victims, “a woman, a man and a minor”, were found later, the coastguard said as Greek rescuers backed by a Portuguese ship and an EU border agency Frontex helicopter combed the waters for the missing. The 31 survivors who were brought to safety had reported a total of eight people missing. An AFP photographer who witnessed the crash from the shores of Lesbos said the boat went down just two or three minutes after the collision, which took place some two kilometres from land. The photographer saw rescuers scrambling to pull people out of the water, with a second coastguard vessel and a Frontex helicopter arriving on the scene around 10 minutes later. The nationalities of the migrants is not yet known but Greece is the primary destination of Syrian migrants fleeing the civil war, via Turkey, trying to find sanctuary in the EU. 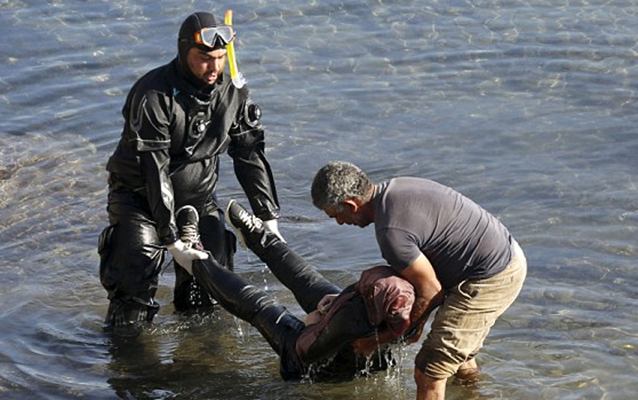 Two men carry a woman’s lifeless body from the sea after she drowned off the coast of Lesbos. Source: Reuters. Scores of migrants have died making the perilous Aegean Sea crossing from Turkey to Greece. On Wednesday, a woman, a young girl and a baby died after their boat sank off Lesbos. In total, more than 450,000 people have arrived in Greece, most of them fleeing the civil war in Syria. The International Organization for Migration says more than 600,000 migrants have landed on Europe’s shores since January, while more than 3,000 had died or gone missing in the attempt. Approximately 4 million Syrians are internally or externally displaced. What this latest tragedy underscores, yet again, is the crucial need for the countries surrounding the Middle East to open up more legal channels for people fleeing war and persecution, so that they do not have to risk their lives to reach safety, a point made repeatedly by the UN refugee agency. The Best Restaurant in Australia. And that’s official. Having difficulty understanding the concept of sexual consent? Think of it as tea.